Growing up, I was exposed to GIS at a very young age. It always held a big interest for me, so after graduating from Riverview I went directly to the Geomatics Engineering program at UNB. During the first two summers I worked for Natural Resources Canada in Amherst, NS, the first summer as a GIS technician in their office, and the second summer as a field surveyor. This group was responsible for maintaining maps of Federal properties around the Maritime Provinces, which meant during my second summer I travelled to many out-of-the-way places in Nova Scotia and New Brunswick. Before graduating from UNB, I decided to take two years off for an opportunity with a Legal Land Surveyor in Whistler, BC, working on many projects in the area leading up to the 2010 Winter Olympics (not to mention enjoying the incredible outdoor experience in the area). I returned and finished my degree in Fredericton, and in my final months talked to a local company called CARIS, a software company dealing almost exclusively in the offshore survey industry. I ended up working for them directly after graduation and am still here today. I started at CARIS in Customer Service, providing customer support and training on the software. This covers several different software packages, but they're all basically focused on seafloor mapping. CARIS is the standard software in this industry worldwide, so the training side of my job meant trips to the US, Chile, Malaysia, Indonesia, China, Australia and more. Most of the electronic and paper charts used by mariners the world over are produced by our software, created right here in Fredericton, NB. 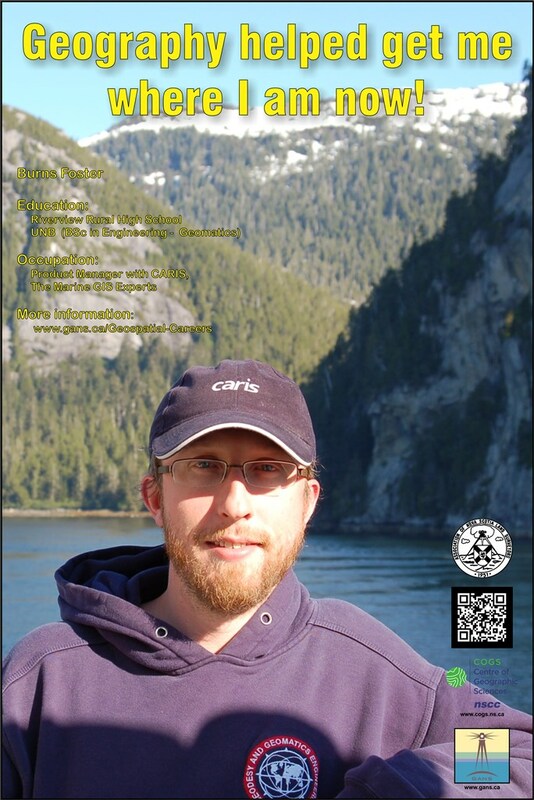 For the last two years, I have been the Product Manager for CARIS' flagship software package HIPS and SIPS, which processes data recorded from sonars on various survey ships to produce high-quality elevation models and images of the seafloor, which are then used for things like mapping of fish habitats, drilling for oil and gas, and creating nautical charts. My job involves talking to Sales and Support staff here at CARIS to understand what our customers need today, and try and figure out what they might need tomorrow, so our programming team can design new software tools to accomplish that. I continue to travel to different parts of the globe, but now I talk to clients directly about those needs, or talk to other companies about new survey technologies they are developing. Recently we've been doing a lot of work with Autonomous Underwater Vehicles (AUV), Autonomous Surface Vehicles (ASV) and various other types of what are basically surveying robots that can think for themselves. An operator decides what area needs surveying, and the robot figures out the best way to get there, map the area and get back. Our software is also used in some high-profile surveys, like the search for flight MH370 in the Pacific Ocean, and during the discovery of HMS Erebus, one of the doomed Franklin Expedition ships in the Canadian Arctic. We worked with the Franklin search team to upgrade our software to create a 3D printed model of the wreck, on display in the Royal Ontario Museum and used for dive training on the wreck itself. We have our own print of the model on display in the lobby at CARIS, which I get to walk by every morning.